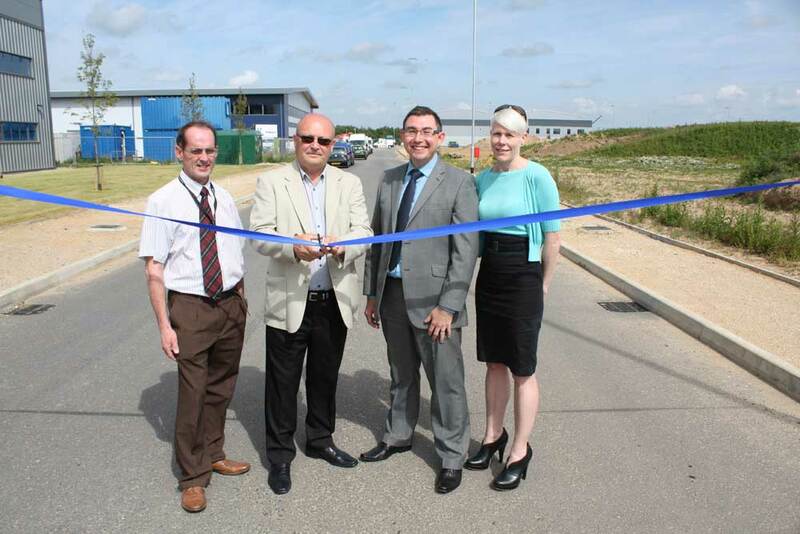 A new access road, which is helping to bring further jobs and investment to Beacon Park, was officially opened on Monday, June 29 with the help of one of the energy sector businesses set to move onto the business park. Beacon Park, in Gorleston-on-Sea, is part of the Great Yarmouth and Lowestoft (New Anglia) Enterprise Zone, which focuses on growing energy-related business within the East of England Energy Zone. Great Yarmouth Borough Council, the owner and developer of the premier park, has been investing £8m to build more than 100,000 sq ft of floorspace in four phases, showing confidence in the strength of the local economy. Now the borough council is investing further funds, together with £3m of Government infrastructure funding, to develop seven more speculative units totalling more than 55,000 sq ft of office and industrial floorspace, as well as key infrastructure. The infrastructure includes a £1m internal access road linking the A47 (formerly A12) and the A143 and associated services, which has opened up for development the remainder of the Enterprise Zone, a further 28 acres, and already enabled three energy sector businesses to invest their own money to build bases. Earlier today, Cllr Graham Plant, the council leader, gathered with representatives of Specialised Management Services Ltd (SMS) to officially open the road by cutting a ribbon. Acteon Group companies, Probe Oil Tools and CIS, are also building new bases at the park thanks to the internal access road. Cllr Plant said: “This road is a key milestone in the continued development of Beacon Park, which is growing quickly thanks to continued investment, including a significant contribution from the borough council, and is providing businesses with the room to further invest, expand and create jobs in the borough. “The borough council and government have spent £1m on the road, which has already enabled the private sector to invest many millions of pounds. As the borough celebrates 50 years of offshore energy operations, I welcome these three businesses to the park, which has established itself as a key hub for the growing energy sector. SMS is building a £3m workshop and office facility, double the size of its existing base, and has also bought an adjacent plot from the borough council for future expansion. This will enable the oil and gas industry specialist, currently based on Harfreys Industrial Estate, to continue growing in the borough and create at least 50 new jobs within engineering and manufacturing. Dave Howlett, the managing director of SMS, said: “The investment the borough council have put into this road has opened up Beacon Park for businesses including ourselves, wishing to continue to grow and invest in Great Yarmouth. The new road is also enabling the borough council to build two new medium-sized industrial units, measuring approximately 25,250 sq ft and 12,500 sq ft including about 10 per cent office space in each. Targeted for sale to businesses in the energy sector, they could bring up to 100 jobs to the park, once completed. The high-specification development includes secure vehicle turning, loading and unloading areas, dedicated car parking space and generous levels of landscaping. Chris Starkie, managing director of New Anglia LEP, said: “The Enterprise Zone continues to expand– supporting more businesses which are bringing millions of pounds of private investment to the local economy.